Description: A high quality, metal constructed multi-pen that I have been drooling over for years.  Refills: One mechanical pencil and two pen refills, see them all here! I have been wanting a Sharbo for the longest time, thanks to my friends over at JetPens for finally making that happen. 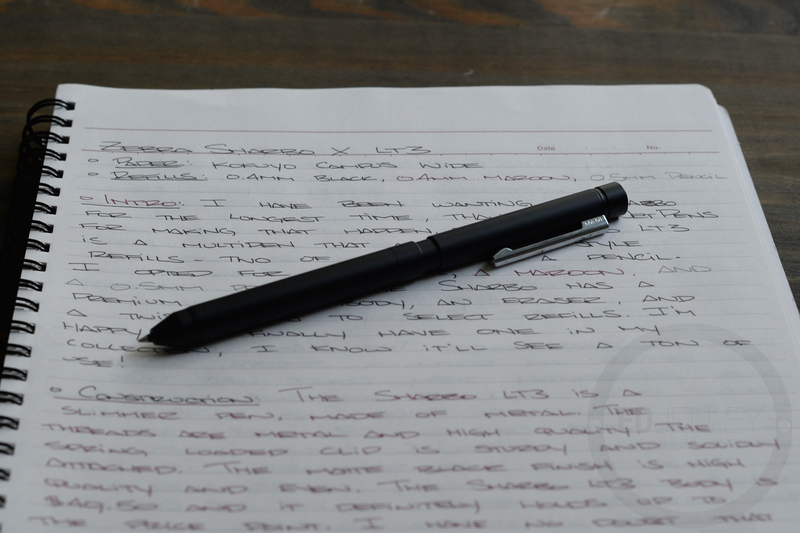 The Sharbo LT3 is a multi-pen that accepts D1 style refills – two of them actually AND a pencil. I used to be absolutely obsessed with multi-pens as a kid, and I’m definitely reliving the fun now. This one is slightly more grown up than the huge, 16-color shiny blue and purple one I had as a kid. 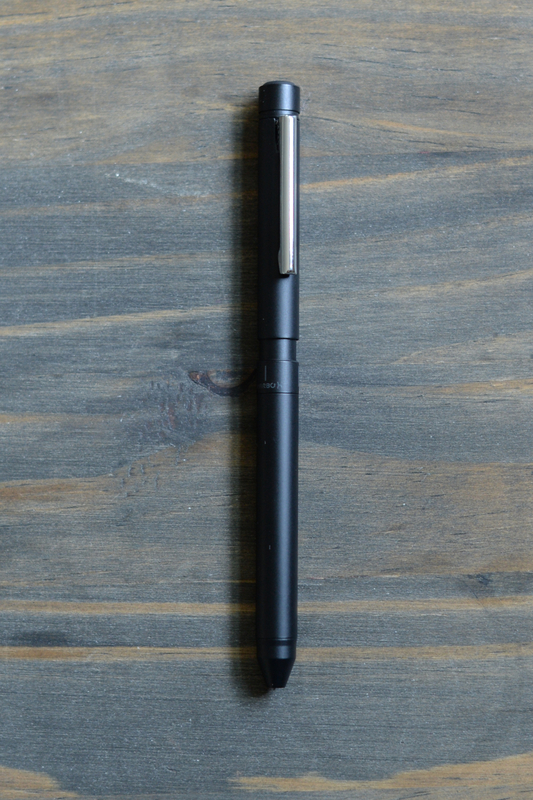 I opted for the matte black body, a black 0.4mm gel refill, a maroon 0.4mm gel refill and a 0.5mm mechanical pencil. The Sharbo has a premium metal body, an eraser, and a twist-action mechanism to change refills. Read on to see how the Sharbo worked for me. Huge thanks again JetPens for sending over the pencil and lead for review! Check out JetPens for tons of awesome Japanese pens and stationery. Free shipping on orders over $25, and hitting that is pretty easy with all the great stuff they have. Stop by! 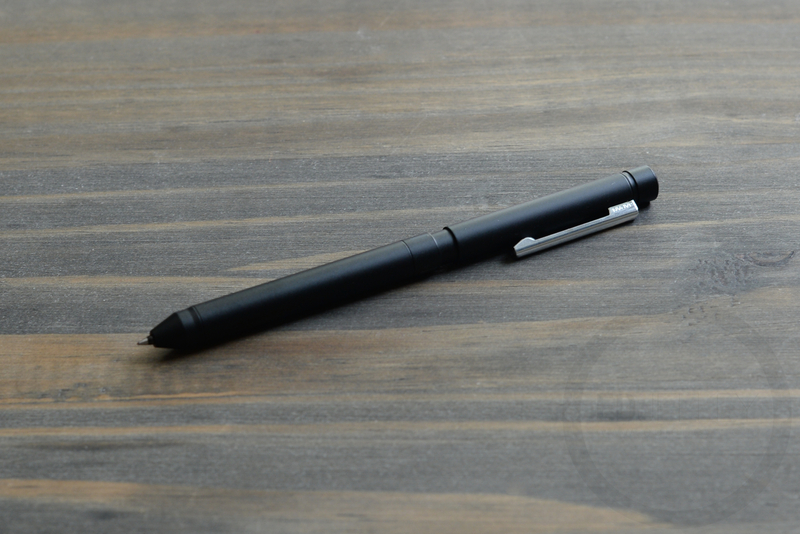 The Sharbo LT3 is a slimmer pen, made almost entirely of metal. The threads when the body is opened are high quality and made of metal. The spring loaded clip is sturdy and solidly attached. The matte black finish has no blemishes and looks great. The Sharbo LT3 body is $49.50 and feels like it should be priced as such. I have no doubt that the LT3 will hold up for years to come. The pen has 3 positions, labeled with subtle hashmarks (I, II, III). I wish there was a fourth “OFF” position, but after carrying it around for a few days I haven’t found the pen opened up accidentally in my pocket. The LT3 is a nice feeling pen. It’s relatively slim ad nicely weighted. It has a premium feel, I especially like the solid yet silent click when the selected refill locks into place. 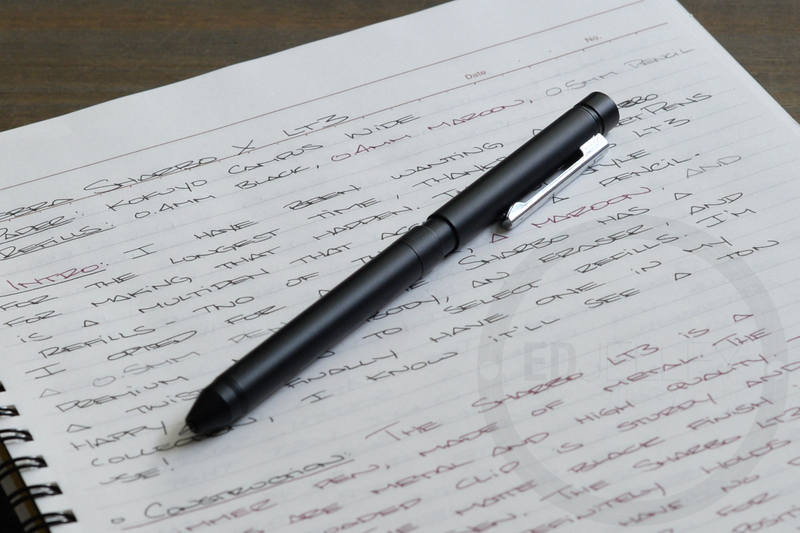 The refills fit perfectly into the tip of the pen with no discernible wiggle while writing, providing a comfortable writing experience. When the pencil mechanism is selected, the entire bottom of the pencil acts as the knock, clicking to advance the lead. 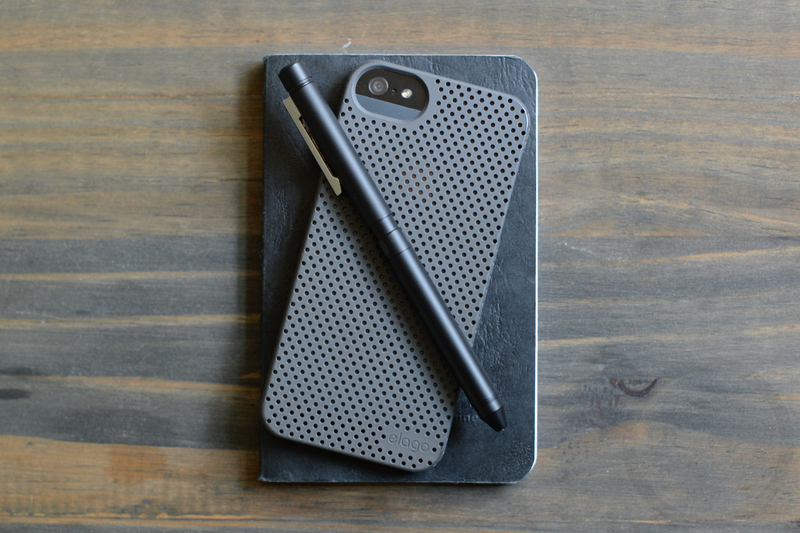 The finish is smooth, but not slippery – the matte finish provides a tiny bit of welcomed tactile feedback. The pen is thinner than I expected, but it’s not uncomfortable. 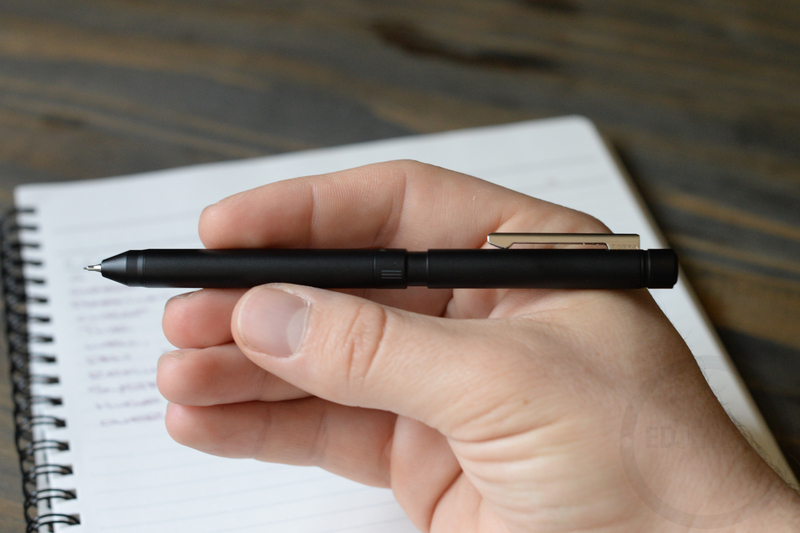 There’s another model of the pen (the ST3) that is slightly wider, but does not have all-metal construction that may be up your alley if you do not like thin pens. I REALLY like Zebra’s gel ink pens. The 0.4mm gel refills I opted for lay down a smooth, sharp line. I have heard that they don’t last too long though – which I believe when seeing how small the refills are. Upkeep can be spendy, as the refills are $2.75 each. I like them quite a bit, so I can look past the price. I especially like how the refills lay down a fine line with a conical tip. 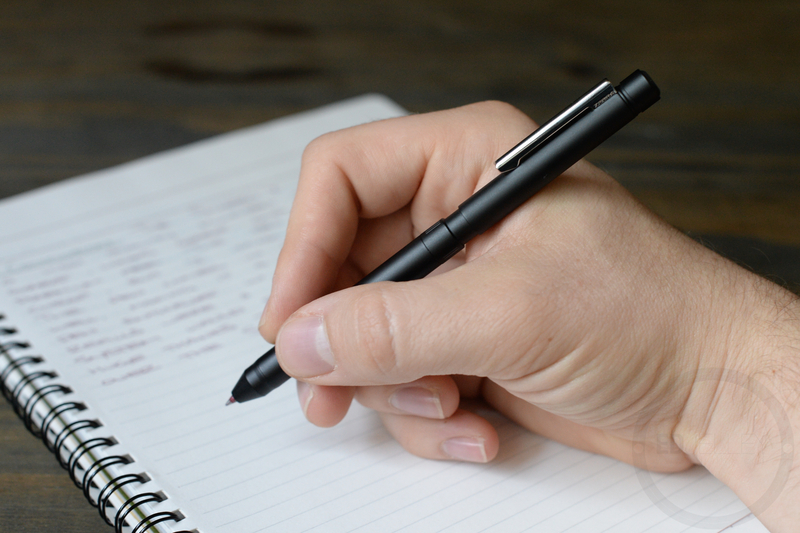 It provides a sturdy writing experience, moreso than a Hi-Tec-C would. I think the Zebra refills are smoother as well. The D1 refills come from Zebra in many different colors and line widths – there’s a ton of ways to customize a Sharbo. The pencil component works well too. I may be slightly spoiled by my ever-rotating Uni Kuru Toga, but the Sharbo’s pencil gets the job done. 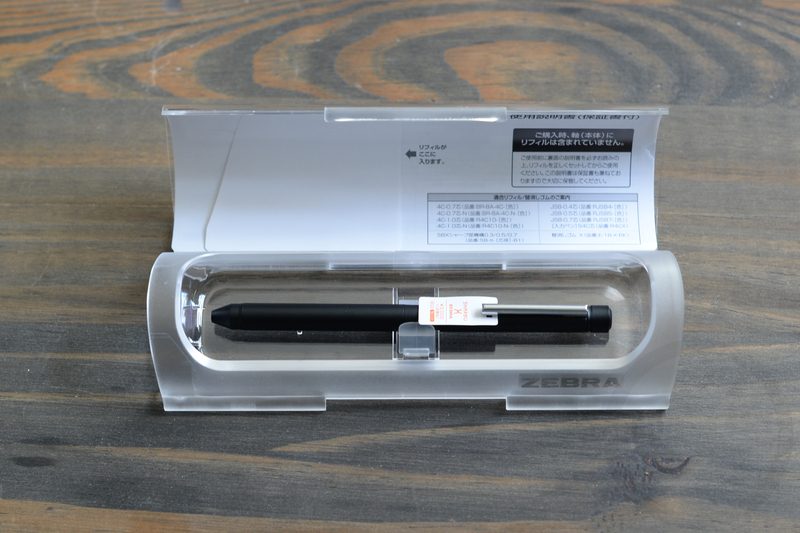 Zebra’s Sharbo X LT3 is a high quality multi-pen that writes great, looks great, and has a very premium feel. The pen doesn’t come cheap at $49.50, but I think it’s worth it. The pen comes in a modern looking presentation box, making a nice presentation for the pen enthusiast in your life. If the refills were a bit cheaper, the pen and Sharbo system would be perfect. Thanks again to JetPens for sending this over to review, check out their site for more info on the pen! Disclaimer: This pen was provided to me as a review unit, free of charge, by JetPens. I was not compensated for this review, and this did not have any effect on my thoughts and opinions about the pen. Thank you for reading! Nice product review of Zebra’s Sharbo X LT3! These kind of excellent pens are very helpful for the professional and personal handwriting like as Mister Snail. Is the pencil cartridge a requirement, or can you load it up with 3 different inks? I own 2 of these pens, so you can only load 2 different inks, pencil cartridge is a must have. Another on the list for me to try. I LOVE the way this thing looks, but the price and the size of the refills have always turned me off. It’s compatible with any D1 refill, not just Zebra, right? It’s really cool. I’ve been carrying it for the week and enjoying it a lot. Refills are spendy, but I love the way they write. Yes, I believe any D1 refill will do the job. I personally prefer the old color version, especially the Grey and Hunter/Herb Green, sadly they are discontinued. I also bought a new black LT3 after I saw your review, the only one thing disappoint me is the color of the clip, I want a all black pen. BTW I am not sure if you have the ST3, if you do, would you mind write a review compared with LT3? I heard some of people said ST3 BLACK is smooth coating not matte black, and part of barrel is made of plastic as well.